Property managers are often aware of the steps they need to take for overall property fire safety, but they may be leaving an important one out- talking to tenants about THEIR safety responsibilities. Here's what they need to know. When was the last time you reviewed fire safety with your tenants? Unfortunately, there is no surefire way to be sure that you will never have a fire on your property, but as the property manager, there are certainly steps that you should take to prevent fire hazards as well as to minimize a fire disaster in the event that it occurs. 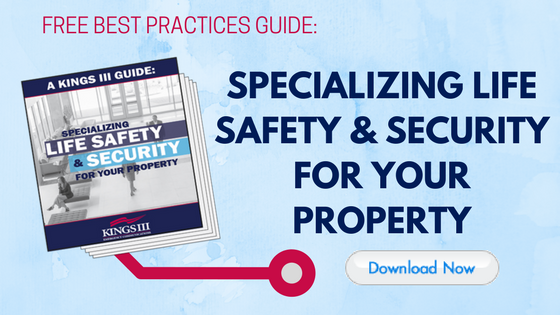 This does not just include developing and implementing fire safety property protocols and technology. In addition, it is essential that you communicate with your tenants about fire risks and prevention. This can save lives, prevent injury and reduce property damage. In fact, tenants may be grateful to realize that they have more control and power when it comes to preventing fires. Take every opportunity to educate them -- through fliers, mailers, tenant meetings, website info, or content on your property’s app -- about fire prevention and safety. Remind them about the most common causes of fires. Most fires begin in the kitchen, due to an unattended stove or oven. Another common cause is smoking, especially in the event that a cigarette ignites upholstery or fabric. During winter, portable space heaters are a major cause of fires. Electrical fires are caused by faulty wiring, electrical appliances and extension cords. Notify your tenants that you will come by once a month to test their smoke alarms. Regularly testing smoke alarms is something you likely already practice, but it’s important that your tenants stay aware of information like this. Send them plenty of advance notice; tenants usually appreciate that you have an ongoing concern for their safety. Keep a checklist of fire extinguishers. Find out if you are legally required to provide fire extinguishers inside of apartments or offices. Either way, make sure your tenants are aware of where all extinguishers reside and know how to properly operate them. 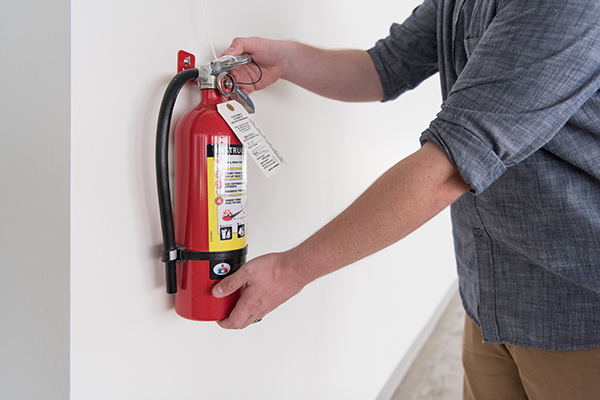 Keep an inventory list of where each extinguisher is located, and make sure they are inspected regularly. This should include a designated meeting point in the event of an onside emergency. Plan to practice this escape route twice a year. This is likely something that you have included within your Emergency Action Plan, but be sure that the information is clearly and regularly communicated to tenants. Post fire safety signs to keep tenants and visitors informed. These signs should instruct tenants what to do in the event of a fire. Signs should also communicate fire exits, escape routes, and actions to take upon discovering a fire on the property. If you rent to non-English-speaking tenants, make sure that they can understand these directions and instructions in their own language -- or provide easy-to-understand visual graphics. Ask tenants if they have seen and understood the signs, and if they have any questions. Remind tenants not to throw water on a grease fire. Water and oil don’t mix. When you dump water on a grease fire, the water sinks and evaporates, but the oil spreads and flames. This happens very fast, and it will harm anyone and anything in its path. Instead of water, remind your tenants to use salt or baking soda, or to throw a wet (but not sopping wet) towel on the fire. Another solution: Tenants can use a metal lid to cut off the oxygen supply. You can post signs with such warnings in public areas or kitchens, or you can regularly send out email reminders or some other form of mass communication to get this message across. It’s one of the first things that we all learn as kids, but many of us don’t actually think to utilize it during a fire that could affect life safety. If clothing is on fire, this is exactly what needs to be done. Tenants who are aware of this method can save their own lives as well as the lives of others. Keep tenants’ emergency contact information updated. Keep it in your software, on the cloud, and in your hard-copy files. Urge tenants to keep an emergency supply kit on hand. Include items like flashlights, batteries, a whistle, blankets and water. As a best practice, you can suggest that they keep an identical supply kit in their car as well. Consider fire ladders within every non-ground level unit. These are not usually legally required; however, a ladder can save lives in the event of a fire, when alternative methods of escape may become compromised. Unless it’s legally required in your state, it may be ultimately up to the tenant to consider this advice. Residential? Require that your residents carry renters’ insurance. Renters’ insurance is often neglected but making it mandatory can save you money and court costs. Policies are relatively inexpensive -- often only about $250-$350 per year. Talk to your residents about how renters’ insurance can benefit them. Suggest tenants store their important documents in an off-site location. At the very least, suggest that they make photocopies of docs like business contracts, reports, birth and marriage certificates, legal papers, lease contracts and other important paperwork. Remind them that building management is not responsible for tenant-owned furniture and appliances. In most cases (check with your attorney), all items that a tenant brings inside a rented property is their own responsibility. This includes furniture, appliances, clothing, office supplies, etc. If those items are found to be the cause of a fire or resulting damage, property management is often not at fault. Be aware of all local fire regulations. Together, be on the lookout for acts of fire safety non-compliance. Overcrowding of premises, blocked or restricted fire escapes, missing or non-working fire and smoke alarms, and tenants who don’t follow the rules are danger signs that both tenants and property managers can look out for together. Consider an emergency phone system for tenants. Kings III’s emergency phones offer the benefit of expertly trained operators (add emergency monitoring link) on call 24/7. We have the ability to dispatch help knowing the exact fixed location, and the information is stored and available immediately. Property managers can be automatically informed in the event of a fire emergency. Compare this to calling for help by cell phone: the exact location may not be immediately apparent, and the property manager is not kept in the loop. When callers use a dedicated emergency phone system, operators assess the situation and verify the type of emergency, dispatching help accordingly. Verified emergencies are placed on higher priority and are attended to more quickly than unverified emergencies. Make sure that your tenants know where all emergency phones on the property are located and are aware of the benefits associated with using one. By following these steps, your tenants will have more knowledge about protecting their (and your) property, they will feel safer on the property and they can help you prevent disastrous circumstances due to a fire. To learn more about how Kings III can increase the safety and reduce risk and liability on your property, visit www.kingsiii.com.